James Graham and Daniel Evans prove a winning combination with Chichester Festival Theatre's latest West End transfer. 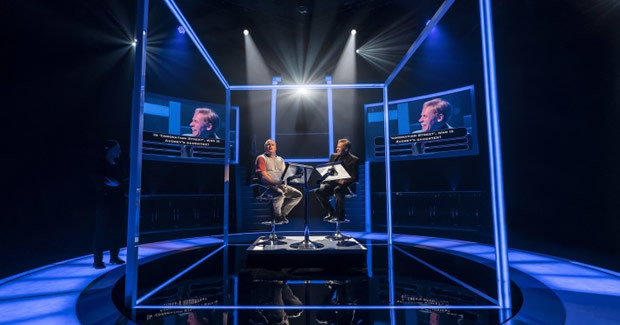 Based on the infamous coughing scandal on popular game show Who Wants to Be a Millionaire, Quiz is the incredibly fun quest into mob mentality, greed, bias and ultimately Britain's obsession over quizzes in every form. Guilty or not guilty? That's the multiple-choice question we are posed twice during the show. Presented with a courtroom, we delve predictably into Selladoor's claims and the Ingram family's protestations. How complicit were Diana Ingram and her brother Adrian Pollock? Did Charles Ingram know he was cheating? Are the coughs hard evidence? What Graham achieves so effortlessly is a subtle manipulation of the audience before the play even really gets going. With an almost unanimous vote of guilty very early on in the proceedings, the reminder lingers – whatever happened to innocent until proven guilty? It's just one of the ways that Graham understands mob mentality. The show itself is a combination of everything I love as a theatregoer; metatheatre, interaction, physical theatre... But whether they marry together in this ultimately political piece is another thing. Occasionally it feels as though focus drifts, as though too many ideas have been pumped into the piece, although Tim Lutkin's lighting and Tim Reid's video design dramatically boost proceedings. At the heart of the show are thrilling performances from a multi-roling cast – a device not used enough in theatre. Keir Charles is downright brilliant as multiple quiz show personalities, but most notably matching the mannerisms of host Chris Tarrant to uncanny acclaim. Greg Haiste knits the show together well as the Millionaire’s producer, whilst Sarah Woodward and Lizzie Winkler also give strong performances. Gavin Spokes is an interesting choice for the Major, and occasionally too “Nicely Nicely”. It's clever, though, how subtle changes in his character successfully alter the opinions of an entire audience. There's a lot of cleverness in an already thrilling show, following two obsessives who found a way to cheat the system. Graham pulls into question British culture, the feeling of unfairness and the lengths that people go to to seek justice. In my opinion, there's no way ITV would mount a case without hard evidence. And if you watch the real tapes, the cheating is decidedly more obvious. But what Graham points out is that as an audience, that's all we have seen. Guilty or not guilty? Final answer?